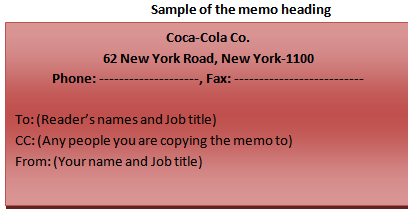 Here you will get Different structure or parts of a memo. There are usually three main parts to a memo:1. The heading 2. The subject and date 3. The message. 1. The Heading: The heading of a memorandum is usually printed. It contains the name of the organization and ‘To’ and ‘From’ sections. Make sure you address the reader by this or her correct name and job title. Be specific and concise in your subject line. 2. 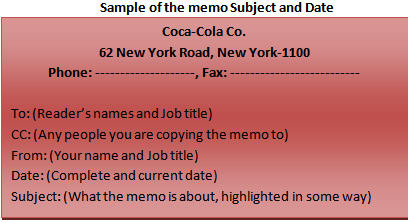 The subject and Date: The subject is a brief statement telling what the memo is about. The subject line is not a complete sentence but rather a concise phrase which indicates some specific information. The date of writing memo is also important to take action in time. (a) Introduction: The message represents the main idea in the first paragraph. it is called the background of the information. (b) Details: In the second paragraph you should write details about information to support the introduction. It should be logical and separate into the paragraph. (c) Response: It is called the action statement. In this paragraph, you should state the action you want to reader to take, Action you will take, Action that you are requested to take, Deadline etc. Just make the information sound fun then you’ll when…………….